Rescued last Monday but what a difference a week makes for a Peregrine! Today she was front and center as we drove up the driveway to Central Terminal, practicing walking on the large arch. Maneuvering up the slope she learns to combine steps and wing action before deciding to take flight. Is Falco now Sage? Love those walking shots and trying to keep balance. 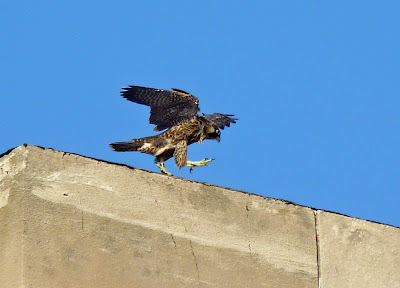 So, no peregrines at the grain elevators? I was hoping we would get to find out who had that yellow band. Thanks for all of your monitoring. Can't believe CT is the only one left to fledge.